Digital Studio Event "Creator Atsumare!" Event Digital Studio Event "Creator Atsumare!" 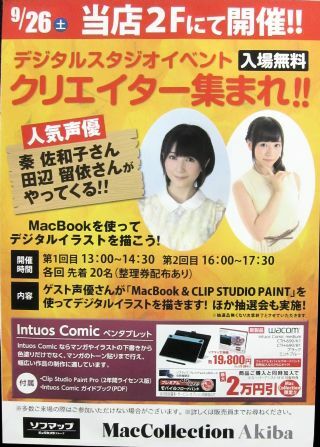 On September 26, there was an event at Sofmap Mac Collection for digital creators, which had two seiyuu guests. The guests were Hata Sawako and Tanabe Rui. The event was free, and there were two sessions 13:00-14:30 and 16:00-17:30, with the limit for each session 20 people. They started passing out the tickets at 10:30, and there were already more than 40 people lined up by then. I arrived just before 10:00, and I was number 36. I cut it too close..
Those at the begining were able to choose which session the could attend, but the tickets for the 13:00 session were gone several people before me. So I attended the 16:00 session. 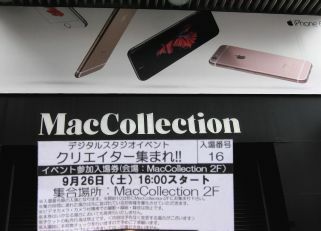 The event took place on the second floor of the store, right near the stairs. At the front of the event area, there was a large monitor in the middle. There were also two tables which had computers with pen tablets. For the crowd, they set up four rows of small foldable chairs. It was pretty cramped. They let in by numbers 10 minutes before the event. There was a small bag on each of the chairs containing presents. There was a 300ml plastic tumbler, the kind where you can change the paper inside to make your own design. There was also a bag hook, and some advertisement flyers. There were 3 no shows! Since there were over 40 people lined up early in the morning, I can't believe three people would just not show up.. The four people behind me were there, so the three no shows must have been people in front of me. I would be very upset if I was one of the few who couldn't get a ticket, and some of those who did didn't show up. The emcee woman gave a short intro, and then Sawako and Rui came from the back (the stairs). Sawako was wearing a pink once piece with little roses, a light white cardigan, and flat brown shoes with short white socks. She had a pink flower clip in her hair, on the left side. Rui was wearing a white T-shirt and black skirt. 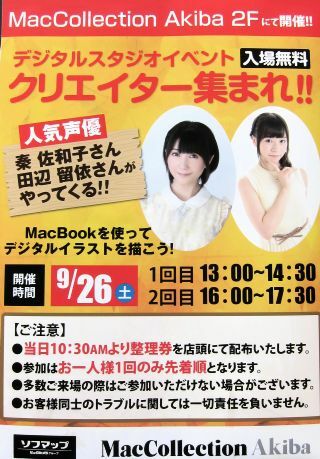 The first 25 minutes or so of the event was talk by the Sawako and Rui, with topics and questions by the emcee. Sawako and Rui both stood on at the front, on the right side. What were they doing during the break between events? What impression did they have of each other when they first met? Then Sawako sang a little bit of an enka song. They talked a little about the Venus Project anime. They mentioned a behind the scenes story of each other during the previous Venus Project lives. Sawako said Rui likes to make a lot of funny faces. Sawako and Rui both said that they liked art. They want to go see the Monet Exhibit that was being held now. After the talk session, one person from the software company came to introduce and demonstrate the software, Clip Studio Paint. Sawako and Rui sat down at the tables with the computers and pen tablets. Then Sawako wrote Rui's name in kanji, correctly. Sawako and Rui had drawn illustrations of their characters from Venus Project, and showed them on the monitor. They both drew pretty well. Sawako said she had the same software at home. She was pretty good at using the various features. The next corner was a battle corner. Sawako sat at the right table and Rui sat at the left table. They had to use the software to draw a picture based on a certain theme. Each battle was 5 minutes, and the winner would get the software. The three themes were "shinkansen" (bullet train), "sake" (salmon or rice wine), and "kani miso" (crab). For each battle, after Sawako and Rui drew the pictures, the crowd would vote on the winner. Rui won two out of three, so she was the winner. At the end of the event, they had a present corner. There were three 3000 yen itunes cards, one drawing pen, one software, two Venus Project Bluray Disc vol.1 (signed by Rui and Sawako), and two postcards of the drawings by Rui and Sawako (2 each). So there were 11 presents for 17 people, very good odds. I got one of the 3000 yen itunes cards. There were a couple posters advertising this event outside of Sofmap.